Limited run one of a kind yoga bottoms made of an organic cotton/spandex blend embellished with Om and seahorse art pieces. Remember, you can always create your very own from scratch in our DYO section. We make the process super simple and quick! These pants are great, and super comfortable. The adjustable waistband is great since the pants are on the baggy side. Some advice: make sure the drawstring tie is loose or at least undone when you wash the pant. This way they retain the ability to tighten to your waist so the pants fit best. 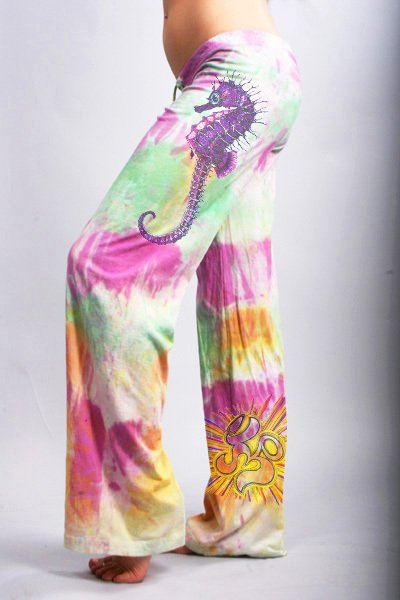 The colors are fun and the seahorse was an asset I had never seen on a pant before, let alone yoga bottoms! Super soft!